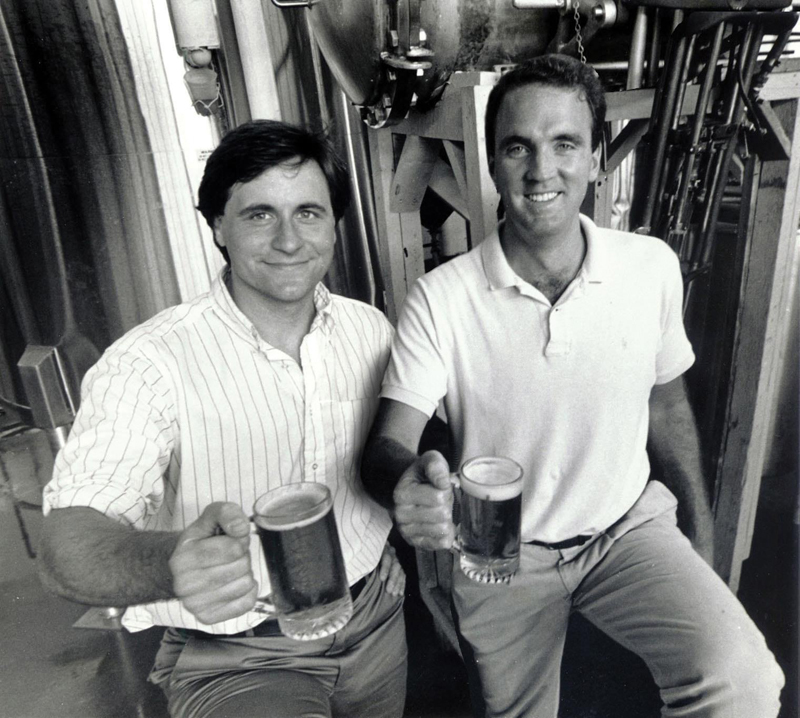 Harpoon Brewery founders Rich Doyle and Dan Kenary. Photo courtesy Harpoon Brewery. On Tuesday, June 2, 1987, two bars in Boston tapped the first kegs of Harpoon Ale. Commercial breweries had returned to the Commonwealth of Massachusetts. Rich Doyle and Dan Kenary delivered the kegs tapped at Doyle’s Café in the Jamaica Plain neighborhood and at the Sevens Ale House in Beacon Hill. The pair, along with George Ligeti, had started what they called the Mass. Bay Brewing Co. in early 1986 (it was incorporated with Massachusetts on June 19, 1986). Doyle, a Harvard graduate, had returned to Cambridge to pursue an MBA at the same university. It was there, in part to avoid classroom time, that he signed on for an independent study project that involved drawing up a business plan. He picked a brewery. 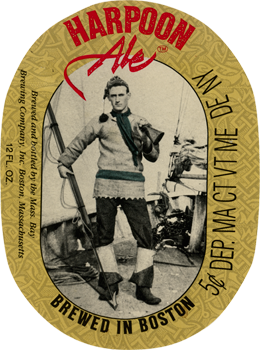 The original label for Harpoon Ale. Doyle had traveled Europe, not to mention worked a spell as a bartender in New Zealand, and wondered why beers back home couldn’t be as flavorful as what he tasted overseas. He was also familiar with the nascent U.S. craft beer movement, including the efforts of Jim Koch, himself a Harvard MBA student in the 1970s, who went on to start the Boston Beer Co. in 1984 (it contract-brewed its beers outside of Massachusetts at the time). And, anyway, the idea of starting a brewery—how cool! So, he, Kenary, whom Doyle knew from before their time as Harvard undergrads, and his roommate and fellow Harvard MBA candidate Ligeti plotted, at area bars (where Coors’ Killian’s Red was considered exotic) and at Doyle and Ligeti’s apartment in Watertown, next-door to Cambridge. Risk, of course, shadowed their plans. There were no standalone breweries in all of Massachusetts. Richard Wrigley, an English transplant who started the first East Coast brewpub since Prohibition, in Manhattan in 1984, had opened the Commonwealth Brewing Co. in Boston’s West End, near the old Boston Garden, in the summer of 1986. That was a brewpub, though. The 1975 closure of the Carling outpost in Natick, just beyond the Boston area, had meant the end of a commercial brewing run in Massachusetts that likely started in the 17th century. Mass. Bay Brewing brought it back. It would become much better known by the first syllables of that inaugural ale offering, Harpoon, crafted by brewer Russ Heissner, who Doyle hired upon the recommendation of Michael Lewis, one of Heissner’s brewing professors at the University of California-Davis. Read more posts about Harpoon Brewery. If beer was invented today, what would it taste like?